Offerali.com is the of pioneer in loyalty based social marketplace. This is a unique and new concept in the world and business which benefits both the customers and the businesses at the same time. So, how this website works? In offerali, as a user you will get thousands of your favorite brands and business under the same platform from a wide ranging industry. Mainly this site offers you to compare any brands or products with others. But there are many other websites which also give you a chance to compare many products or services. So, what is the difference between those and offerali? The main difference is that where other websites compare products or services based on their price, offerali does it based on the product experience by the previous users or consumers of that particular brand. Because, in offerali, we believe that there is no greater judge of a brand than the end users or consumers. Hence, any consumer or customer of any products or services can give their review about the brand and rate them on a standard rating of 5. Where 5 is the highest rating for a service and 1 is the lowest. So, where other websites only compare with price, offerali compares that same product based on the customers or consumer’s perspective where price is only a single determinant. But that is not the only great news for the customers. Because, while rating or review any brand, they won’t have to do it for free. With every review or rating, the user will get bonus point which later they can easily avail free offers from their brands. Now consumers can promote their favorite brands or can tell about the scope of improvement to the brands that they got disappointed with and win lucrative free offers for doing that! Here is a step by step guide for you. Get started on offerali by clicking the sign in button. Signup or Login to offerali. You can sign up through your facebook or google account. Or you can simply join with your existing email. After clicking the sign up button this form will appear. Provide the required information & register. An activation mail will be sent to your Account. Open & click to activate your account. You will be automatically logged-in to your account after activation. Click the button with your name on the top right corner of the screen to check your profile and other amazing options. Find a Brand or Business. Find your preferable Brands as your desired category or location. From the suggestions, select your desired brand. Selected page will give you the detail status about that brand. Rate Marchent and earn points. If you have been there click on the been here button and earn points. If you are owner of the business click on claim button. You can upload pictures of your favourite moments with that brand and also get points. Write a review and get points. See your published reviw edit it if required and like or comment on other's reviews. Click on the button of top right corner to see your options. Your Account settings and other necessary options are here. To see your profile, click on the profile button on top right corner. In your profile you can see all your previous activity like your reviews, shared photos, etc. You can also see your recent activities too. You can see all of your photos and also upload photos from here. If you apply been here to any marchent you can see all of them here. 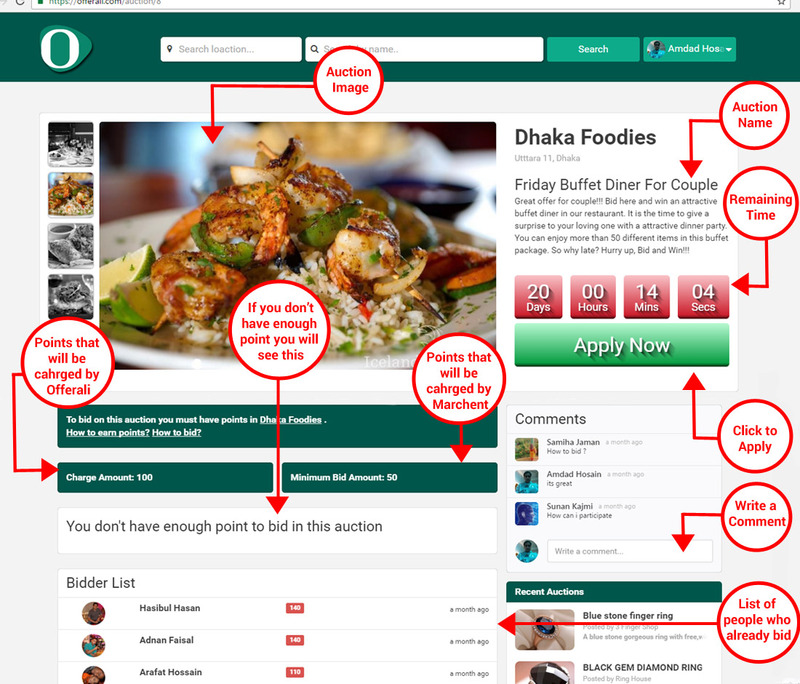 In this page you can see your auction( you can know detail on auction from below) history. There is a form in this page for refer marchent. You can refer any business to open their page in offerali. If it is approved you will get points. You can go to your profile page by clicking the setting button in the top menu. You can reset your password and other profile information here. One of the most awesome part for you in offerali. You can bid for any free offers from any business with your loyality. The higher bidder will win the auctions. To see your aligibility, click on any auction offers. The page for auction details.